Element Gym hosted an evening of amateur boxing followed by a viewing party of the Ganady Golovkin-Saul Alvarez middleweight championship fight on Saturday, September 15. It was a night of great fun as our Element boxers, Deonte Sampson, Lawrence Sanders, Phil Sherman and Brandon Beck, put on a great show and the crowd enjoyed the professional, HBO pay per view broadcast. 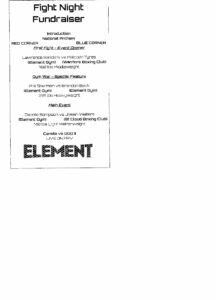 The lineup of the first Element Fight Night Fundraiser was a great success. Opening the night, welterweight Lawrence Sanders boxed very well, improving with his best performance yet against the tough and elusive Malcom Tyree from Born Warriors Boxing Team of North Minneapolis. Tyree slipped well and landed some good shots when able to get inside, but Sanders was too much for him, controlling him with a fast, stiff right jab from the southpaw position and catching him with good combinations. The two combatants warred throughout the three rounds and as they tired a little late in the third, Sanders was able use angles and movement to come away with the decision. In the main event, Deonte Sampson clearly outboxed a game Josiah Weiters of St. Cloud Boxing Club to win a decision in their welterweight match. Sampson started fast in the first, throwing combinations behind a crisp, rapid jab. He slipped well, controlled the pace of the match and showed superior ring generalship, landing hard punches in varying combinations. He scored a clear decision after a long delay since his last competition after skipping this year’s Upper Midwest Golden Gloves. Now back in action, he is prepared to continue victoriously the rest of this year and be strong in next year’s Golden Gloves. The first Element Fight Night Fundraiser was a great success and will hopefully be the beginning of many more to come.